Now. 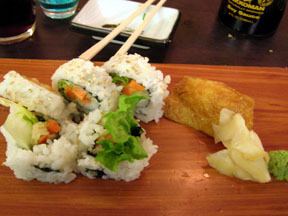 I can probably go weeks (though rarely do) without visiting a Japanese restaurant. But knowing that I'm cut off for a week, means that I have to get a visit in before the holiday begins. Tempura vegetables, yam roll and inari, sunomono salad, edamame, agedashi tofu , and a gift from our server - fruit flavoured sake (strawberry, blueberry & peach). After dinner we strolled over to the Kenaston Wine Market. It's located in the same strip as Bimi and always has a great selection of kosher wines. The salesperson who helped my out tonight was knowledgeable and really helpful. I have wine issues. I like wine - and if it didn't give me a rash, I'm sure I'd give it more thought. I picked up a bottle of white to take to a seder next week, and a bottle of red to use for braising some lamb shanks later in the week. It's midnight here - and I need to be at work at about 8 am tomorrow - so I'll be going now. Please ask any questions you have - I'll be rather busy over the next few days, but after all the orders are picked up Wednesday afternoon, I'll have some actual free time to catch up. Hopefully tomorrow you'll see pictures of my store. Thanks for the link about the bitter herbs -- romaine lettuce -- who knew? It makes sense, though. With our move, we wanted to fill a need in the area we moved to. 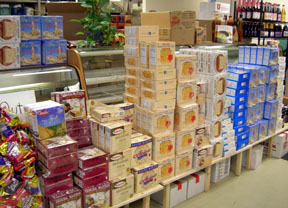 Hard to get kosher products, prepared foods and some catering. Pam, what are some examples of the hard-to-get kosher items that you're now providing? I don't know if you know about this website already, but eLuna is a website for Kosher restaurants in Israel. The restaurants offer 10% discounts and they also offer an aution for dinner for two. The critiques are not written by professionals and I don't always agree with the writers, but that is another story. It also has menus and information about some of the caterers in the area. One in particular to look at is Claudine. Until very recently it was a non-Kosher high-end French restaurant and now they are Kosher. The nice thing is that they are offering a take-out menu for Passover. PamR, you are a brave lady, blogging at this time of year. Thank you. I enjoyed your last blog very much and I also learned a ton. I particularly enjoy your sense of humor about life and its little quirks. Not knowing the correct form of greeting (tho I could probably figure it out by rereading this thread), I'll go with a heartfelt generic - Happy Holiday! Great to see a Manitoban blogging! Looking forward to seeing your new store. 'morning all. It's been a crappy one. I overslept - finally got out of the house and was stuck for 15 minutes by a train. (Upside, it let me eat my fruit leisurly in the car while waiting for the train to pass.) Got to work to find that one of the breakers went at some point this weekend and a cooler was down. Not a large cooler - but I've had to throw out a bunch of dairy products and deli stuff - all things that had been put aside for my best customer. Not only did I have to throw the stuff out - but I don't have enough of everything to replace it with. If there's a funny note in this - it's that she left the stuff here because she was going to be out of town and was concerned that something might happen to her refrigerator while she was away. I've also lost a few batches of curd that I needed - and am taking a break while my lovely assistant Rachael juices more lemons for me. And I'm de-stressing (trying to) because there's a long day ahead. Oh Chris... time will tell! I'll fill you in a little later. Thanks to all of you for your kind words - it does make me feel good. Especially this morning! Today: I'll be in the kitchen this morning - trying to finish off any baking odds and ends that I can. I'll also take some pictures of what the others are doing. At 11 AM the store opens. We're not usually open on Sundays, but for the last 2 weeks, today and next Sunday our official hours are 11-3. Last Sunday the last customers left at about 6:30. I'm expecting a lot of people in here - and we've called in the reinforcements. In addition to the regular staff [me, mom, dad, Hazel (full-time) and Rachael (part-time)], my sister, a cousin and a friend will all be in to help. These extra helpers will be in over the next three days - along with one other helper who will do some delivering. Sorry about your cooler. I hope all will be better from now on. Thanks for the links. I've bookmarked them for later perusal. We open in 5 minutes, and we've already had 5 customers. Auntie Ida arrived to help out today. Nice surprise. The name of our business is Desserts Plus - but it's really a misnomer at this point. My mother started the business in the early '80s. She baked for some local restaurants and would go into synagogues to bake for friend's bar/bat mitzvahs. Eventually she had people asking her to cater entire functions and my father quit his job as a commodity broker and joined her in the business. I grew up there. I'd walk over the our store after school and peel potatoes or just hang out in the offices. I have vivid memories from junior high of sitting at a counter in various synagogue kitchens on a Sunday evening studying or doing homework while the place was buzzing as my parents were catering a wedding for 350 people. We've discussed changing the name of the company to better reflect what we do - but our name is very well established here. Anybody have any suggestions? In the meantime, we've added the line "so much more" to our sign. Desserts Plus... so much more. Get it? But there are still Jewish people who have no idea of what we have to sell... and non-Jewish people coming in all the time.. who have no idea what we do. This picture was taken a couple of days ago. About 2 days before it was taken there was still snow covering much of the 'grass' area. In a few weeks, it will be much less... brown. 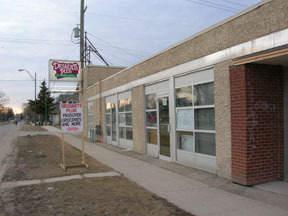 We rent the whole building and then sub-lease a small part to a gelati store. Their entrance is to the right of the brick, and we're in the rest of the space. I wouldn't change the name. Your business is well established with the name. Why confuse everyone. Several years ago we were having difficulty getting kosher poultry locally - so we started bringing it in from Toronto for our own use. A few years ago the local, kosher poultry slaughter-house shut down completely and all kosher chicken, duck & turkey needs to be brought in from out of province. There is also limited kosher slaughtering going on for beef and lamb. What there is basically goes to the one kosher butcher shop in the city. 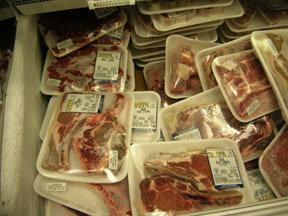 Add to that the fact that not everybody in the city considers the local levels of kashrut to be high enough - there was a demand for meat to be brought in. Kosher Dairy- If you go into most of the grocery stores in the Winnipeg, the only kosher cheese you'll find are cream or cottage (and some chevre). For years we've sold hard cheese - cheddar, mozzarella, marble, Gouda, muenster as well as feta, string, slices and parmesan. In the last few months, after a lot of phone calls and a business trip to New York and Toronto, I've been able to add brie, camembert, romano, swiss, fontina and the more exciting Israeli cheese (keter, emek and the low-fat white cheeses). We're also bringing in leben, eshel, milkies (pudding with whipped cream topping - it's an Israeli thing), chetzo chetzi (more Israeli pudding) and I'm working on some more. 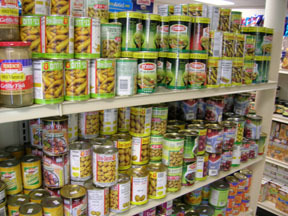 Israeli Items: In addition to the dairy, we stock Israeli pickles, olives, snack foods, chocolates, cakes, cookies, juices, spices and cooking products. Regular everyday items: If you walk down the aisle of any grocery store in the US, you can purchase 100's if not 1000's of items that just happen to be kosher. In Canada, many of these same items aren't. Some examples include Oreo's, Kit Kat bars, baked beans, salad dressings and and taco shells. 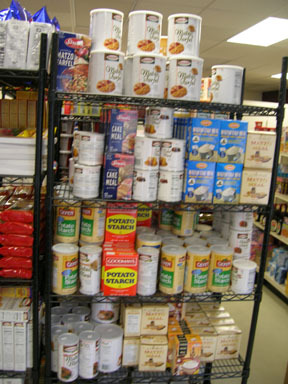 We try to bring in some of these items (you have no idea how many cans of baked beans we sell ). 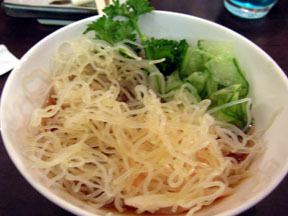 Ethnic Foods: Sushi ingredients (nori, wasabi), Mirin, coconut milk, chili sauce and rice noodles. 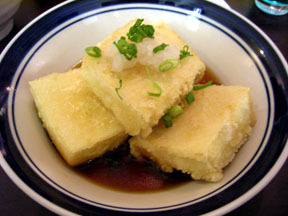 Sesame oil, tamari, soy, sauces and vinegars. Then we bring in the "Jewish" items. Candles, matzo meal, potato starch, herring, horseradish, pickles, etc. If you think Winnipeg is a hotbed for the production of any of these items you'd be barking up the wrong tree. All of these items need to be "sourced". I spend hours each week phoning suppliers, emailing companies and going through product lists. Now for Passover ... things are different. 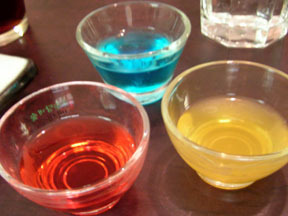 There are many foods that are forbidden during Passover. 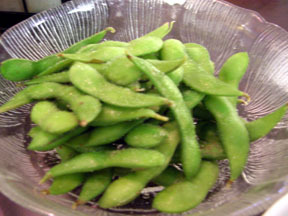 Many people try to clean their homes completely of these forbidden foods. It's just unrealistic for a business to do so. What we do instead is pack up any of these items and fill the stockroom with them. 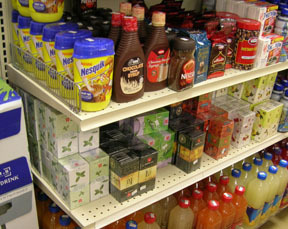 Then all of the shelving in the store is washed down and sanitized and we restock the store with all of the Passover products. A side note on observance levels seems like a good idea here. This is what I've noticed over for the years. 1. People who don't care at all if food is kosher all year or for Passover. 2. People who don't keep kosher in their homes, but will by kosher meats and dairy for Passover. These people may or may not feel it's necessary for other items to be kosher for Passover. 3. People who care if their food at home is kosher, but will eat in restaurants during the year. These people will not eat in non-kosher restaurants during Passover. Their meat, dairy, processed foods and more ingredient items will be kosher for Passover. 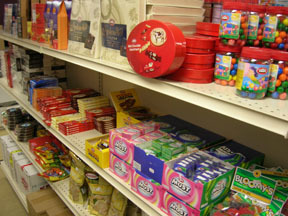 But they will buy certain items at the regular grocery store, as long as they open fresh bags/containers for Passover (like sugar and spices). 4. People who do not eat in non-kosher restaurants and will only purchase items for Passover that are stamped with a 'kosher for Passover' sticker. So we have people coming in for a few items, or they're coming in to get everything they need for the week other than produce. Matzo meal, cake meal, potato starch and farfel. 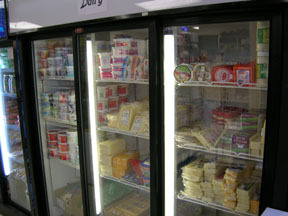 The dairy cooler - we've had to restock most of it's contents daily over the last week. Milk, iced cappuccino, hard and soft cheeses, cottage cheese, puddings and yogurts. 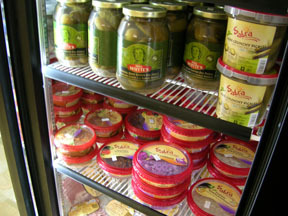 The ever-popular Israeli pickles and olives. 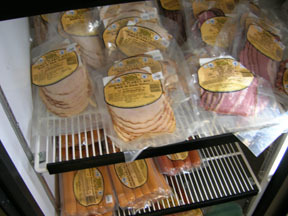 Cold cuts and hot dogs. 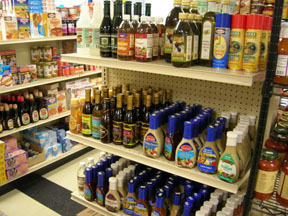 Vinegars, oils and salad dressing. Breakfast foods, soups & side dishes in the back. 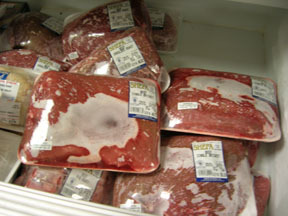 Veal, lamb and beef cuts. 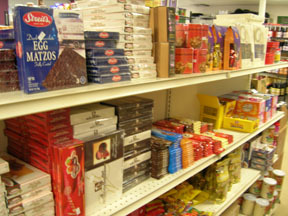 Chocolates - including chocolate covered matzo. And more chocolates, candy and gum. 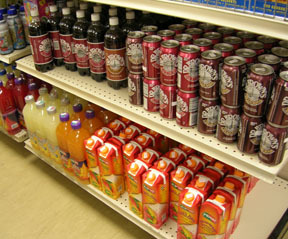 Dr. Brown's Soda and Prigat juices. Israeli Nesquik, coffees (Turkish & instant) and teas. 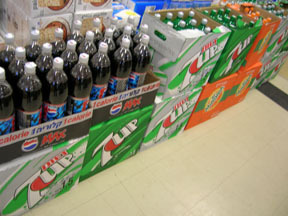 Pepsi, 7-Up and Orange Miranda from Israel. If you squint, you can make out the Hebrew on the packaging. The two big items for Pesach (Passover) are matzo and wine. For those unable to drink wine (and for most children apparently) it's grape juice. As we are not licensed to sell wine, we sell lots and lots of grape juice. I thought I was being smart with the matzo. This is the first year we're really doing Passover in the store area, so I wasn't sure what to order. I thought I should mix it up a bit. So I got regular matzo, shmura matzo, whole wheat matzo, spelt matzo, light matzo and egg matzo (and chocolate covered matzo!). Brands I had included Manischewitz, Streits, Osem, Aviv, Carmel, King David, Bnei Barak and Yehuda. Do you think this was satisfactory? 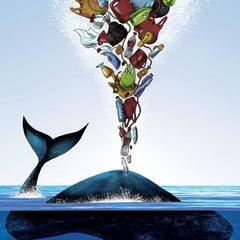 For many people it was more than they could ever want. For others, I had the wrong brand of this and the wrong brand of that. I'm taking notes. But to satisfy everybody, I'd have to bring in over 20 varieties. Israeli and American. Red and white concord. Lite and sparkling. Blush, rose, muscat and chardonnay. Peach, raspberry and apple (all sparkling). I'm going to try to figure out how much of this stuff I actually got in over the last few weeks. 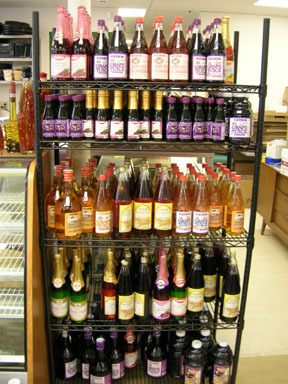 We had a special - if you spend over $150 with us, you received 1.5 L of grape juice or 5# of matzo on us. We also kept the prices on these two items as low as we could. So they've been flying out. Wowzers!! I wish I could find that variety in London( Ontario). You have an amazing store Pam. Is that Friendship cottage cheese btw? I fall under catagory 1( I feel like such a bad jew admitting that). My family kept kosher for passover only and when my parents divorced, they didnt seem to care anymore. I wish I knew some Jews around here so I could finagle an invite to a sedar. I really miss them!! edited to add: I'm craving a dr. browns black cherry now AND is Yoohoo Kosher? Thanks. I'm really proud off how it's pulled together over the last few months. A lady I have never met before came in and looked around and pulled me aside and hugged me because I had the Sabra salads. One little thing can really make somebody's day. You have no idea how many times I've heard in the last couple of months that people no longer have to schlep bags of products home with them when they're going to Toronto, New York, Chicago, etc. We've really made it a point to try to get what people want. Whenever somebody asks me for a product I do what I can to get it in. Some items are easy to find - some I've been working on for months and don't think I'll be able to get. We have even started an email list for our customers. They can sign up and whenever we get new or interesting items in, I send off an email. I've had people show up within an hour of receiving the email. No. I'm not sure which one you're referring to - but the cottage cheeses are Breakstone, Mehadrin and Tara (and Western Creamery's pressed cottage cheeses). When I went to university, I was the only Jew in town. Well.... people kept telling me there was a Jewish lawyer, but I never met him. It's around the holidays that you really begin to miss these things. Isn't there a synagogue in London? or even a Jewish Students Association? I ... have... never had a Yoohoo. Can you get them in Canada? I went to their website and a search for 'kosher' turns up nothing. Maybe somebody else knows? The saga of the refrigeration continues. This time it's the walk-in. Our last customers left at about 7 PM. Stuff was still being done in the kitchen and some stocking was being done in the store. At about 8, everybody was ready to leave and we noticed that the walk-in cooler is running at too high a temp. and seems to be cycling too frequently. So the staff went home and my father called a 'guy' to come fix it. It's 9:40 PM now and we're waiting for him to arrive. There are no pictures of dinner - but I think I had the same thing as last year - so refer to that . I would really like to go home - but I'm waiting it out with Dad. Orders had to be in by last Tuesday. We have 140. People keep calling, and I'm sure will continue to call until Wednesday, hoping to place additional orders. We just can't handle anymore. We will try to have extras available, if possible - but it will work on a first come, first serve basis. Our menu is mostly Ashkenazie foods (exceptions being desserts). 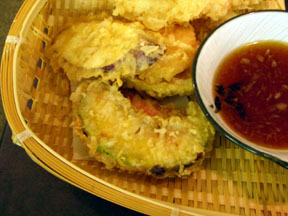 every few years we try to add new and interesting items to the menu - but people continue to order the traditional items. It's about 11 PM here. I'm going home to have a LARGE glass of iced lemonana juice (my favorite juice of the moment - lemon juice with a hint of spearmint). Then I'm turning in. Pam, that's an amazing lineup of stuff you're cooking. How long does it take to cook how many of those? 140, you said? One question: What is Mandarin salad? Salad with mandarin oranges? The Manischewitz matozs that I bought say..not for passover..do they sell some that are? Wouldn't they all be kosher for passover?